Yippee! It's my turn to host a designer's choice challenge at The House That Stamps Built. The subject of my challenge is "All Creatures Great and Small". Repeat Impressions store is loaded with absolutely fabulous critter and creature stamps. I used to enjoy reading the books by James Harriot, a British veterinarian and author, about his tales of visiting country farms and all the animals he treated and connected with throughout his career. Seeing all Wendy's critter stamps reminded me of these books, so I used the title of one of them for this challenge. The process to create this card was stamping, masking, sponging and coloring. The stamps I used on this card are RI#8101- "Bulldog", RI#2604-I "Cat with Ribbon", RI#5124-C "Rabbit Sil (sm)", RI#2617-D "Tiny Bird (flight)", RI#1326-A "Ladybug" and RI#5125 "Dragonfly Sil (sm)". 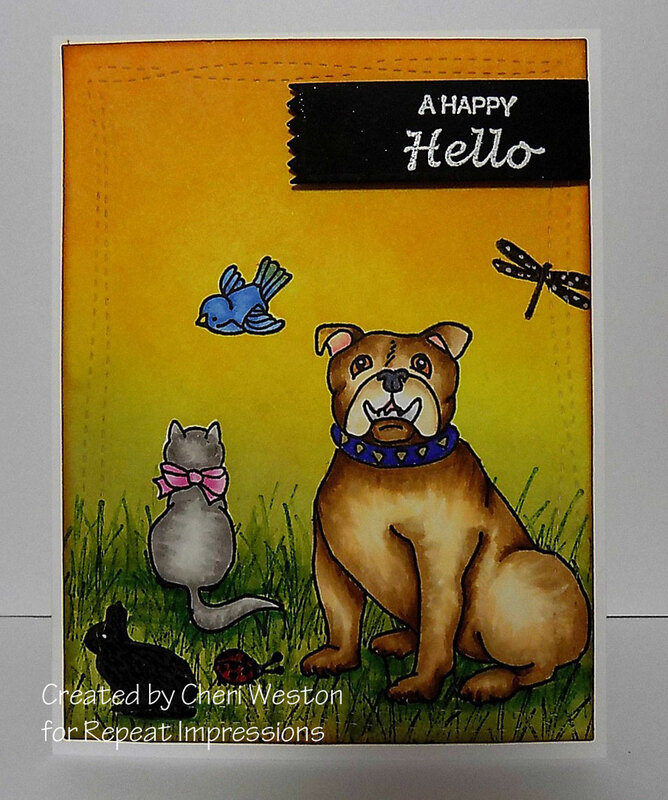 Also used on this card is RI#1507-J "Grass Border" and RI#9717-C "Happy Hello". I hope you'll join me and my Rock Star team mates and play along with this challenge. The details on how to enter and how you can win Repeat Impressions Stamps can be found at THE HOUSE. Here are the blogs of the Rock Stars for incredible inspiration for you. Here's a James Harriot quote I thought you might like "If having a soul means being able to feel love and loyalty and gratitude, then animals are better off than a lot of humans." Awesome coloring! Love that bull dog! What a stunning and realistic scene and so much dimension in it! Perfect for this challenge! Oh Cheri- This is so cute! So cute!!! And what a fabulous scene you have created with all these cute critters! Outstanding coloring, Cheri. Great scene. your background is absolutely amazing and I love all the sweet animals! Our family has really enjoyed the TV series about James Herriot - those are some great stories! All that masking, sponging, and stamping -- Wow - You took your card to a whole new level! What an awesome background too. You really put a lot of work into this!